Healthy Food Guide shows you how to eat well every single day – without compromising on taste, spending hours in the kitchen, or more money at the checkout. Healthy Food Guide is a monthly magazine that makes it easy for anyone to make healthy eating choices. 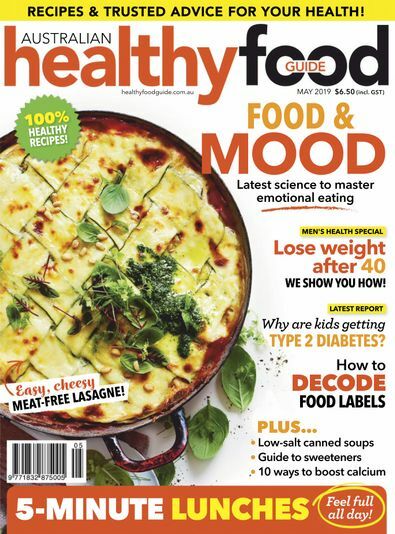 Every issue contains practical advice from expert dieticians and nutritionists, dozens of tips and ideas to help consumers and those with special diets choose the right products at the supermarket. Plus a month’s worth of healthy recipes, all with a complete nutritional analysis showing kilojoules, fat, protein, carbohydrate, sodium and more. The Healthy Food Guide magazine is such a great read and so informative!